Born of a humble background on the 8th July 1916, Col Shamsher Singh joined the Patiala State Forces as a JCO cadet in 1937 because only wards of rich landowners were selected as officer cadets by the then Maharaja of Patiala. However his better educational qualifications, sincerity, hard work and he being an outstanding sportsperson and a star athlete, soon got him noticed. His tremendous leadership potential too was recognized and he was nominated to the Indian Military Academy to train as an officer. 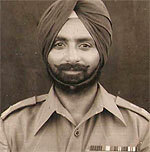 He was commissioned as an officer and was part of the Indian contingent of the British Army that went to Aden and Mesopotamia in World War II. 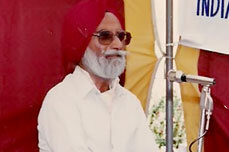 Col Shamsher Singh was absorbed into the Indian Army post independence. Soon after, in 1948, he earned laurels for himself and his battalion by the recapture of the crucial Zojila pass from Pakistani forces that far outnumbered him and his troops. 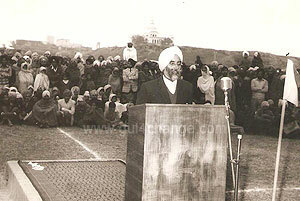 He joined the SIKH REGIMENT IN 1954 and subsequently retired as a Colonel from the Regimental Centre in 1966. He was known far and wide for his foresight, integrity and uprightness. In his civil life, post retirement, Col Shamsher immersed himself in working for the upliftment of the poor and needy and extending a helping hand to anyone who wanted help. He was Sarpanch of his village Mahadian for 20 years (as a unanimous candidate), where he set new standards in infrastructure and sanitation. He worked hard to ensure the consolidation of the Shamlaat land of the village which has been a great source of income for the Panchayat ever since. He made sure that the village streets were concretized throughout way back in the 70’s. He worked relentlessly to help establish various educational institutes in Fatehgarh Sahib district including the The Baba Zoravar Singh Fateh Singh High School and the Engineering College. He also worked tirelessly for the welfare of Ex Service men, helping countless retired officers, JCOs, soldiers and their widows resolve medical and pension related issues.